Loukas Barton earned his PhD from the University of California, Davis in 2009 and a BA from Yale College in 1997. As an archaeologist, he studies the material record of change in human behavior, social organization, and survival over long periods of time. On a theoretical level, he is interested in cultural, ecological and evolutionary factors that lead to behavioral, technological and social change across human populations. More specifically, he studies the transition to agriculture in East Asia, resource intensification in southwest Alaska, the late Pleistocene peopling of Eurasia, and the relationship between environmental change and cultural evolution. Dr. Barton is also Associate Editor for the journal, Archaeological Research in Asia, and Associate Director of the Center for Comparative Archaeology at Pitt. Prehistoric Human Ecology of the Uvs Nuur Basin, Mongolia. Elements: Regional archaeological survey; lithic and ceramic analysis; landscape evolution; paleoecology. Regional Focus: Uvs Nuur Basin, Uvs Aimag, Mongolia. Cooperating Institutions: National Museum of Mongolia; University of Nevada, Reno. The impact of mid-Holocene volcanism on human adaptation and cultural diversity on the Alaska Peninsula. Elements: Regional archaeological survey; landscape evolution; paleoecology. Regional Focus: Chignik and Meshik Rivers Region, Alaska. Cooperating Institutions: National Park Service; University of Alaska Museum of the North; U.S. Fish & Wildlife Service; Antioch University. The evolution of intensive fishing on the Alaska Peninsula during the middle Holocene. Elements: Excavation; lithic analysis; faunal analysis. Regional Focus: Little Takli Island, Amalik Bay, Pacific Coast of the Alaska Peninsula. Cooperating Institutions: National Park Service; Pacific Northwest Resources; University of Alaska, Anchorage. The archaeology of archaic and modern humans in northeast Asia. Elements: Hominin migration, interaction, and competition; lithic analysis; faunal analysis; geomorphology; settlement pattern analysis; pushing the limits of OSL and AMS dating. Regional Focus: The Longxi Basin of Gansu Province in China's Western Loess Plateau. Cooperating Institutions: Lanzhou University; University of California; University of Nevada; Institute of Vertebrate Paleontology and Paleoanthropology; Gansu Province Kaogusuo. Holocene hunter-gatherer mobility in southwest Alaska. Elements: Landscape archaeology; raw material provenance and conveyance; XRF. Regional Focus: Alaska Peninsula; Aleutians; Kodiak Archipelago; Kenai Peninsula. Cooperating Institutions: National Park Service; University of Alaska Museum of the North; Alutiiq Museum and Archaeological Repository. Elements: Arid-lands adaptive strategies; paleoethnobotany (macro and micro fossils); paleoecology (palynology, soil geomorphology & geochemistry); stable isotope biochemistry; anthropogenic burning; plant and animal domestication; pottery and lithics analysis. Regional Focus: Chinese Loess Plateau; Tengger Desert; Ordos Plateau. Cooperating Institutions: Lanzhou University; University of California; University of Nevada; Gansu Province Kaogusuo; Chinese Academy of Social Sciences; University of Illinois Urbana-Champaign; Durham University. 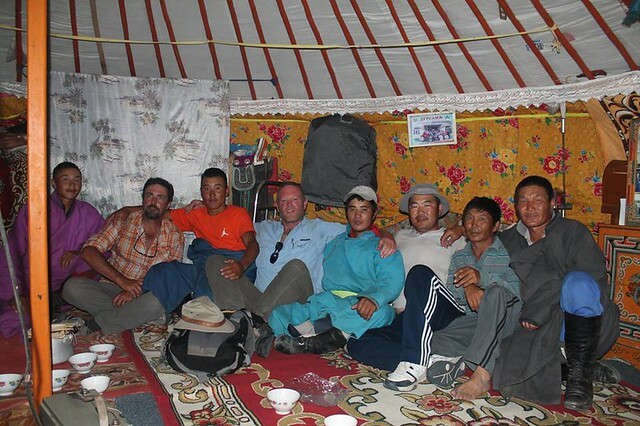 All of my research efforts are the product of intensive collaboration with students, mentors, friends and colleagues from American, Mongolian, European and Chinese research institutes, United States federal agencies, and the local residents and community organizations of northern China, northwest Mongolia, and southwest Alaska. Undergraduate Lecture. True to rumor, archaeology involves priceless treasures, exotic locations, and fantastic imaginations. But like the dirt, the insects, the tedium, and the jet-lag, these are merely trappings of a much larger trade. The purpose of archaeology is to understand people, how they relate to one another and to the world around them, and how these relations change through time. Archaeology does this by looking at these changes on a temporal and spatial scale that no other body of inquiry can. Archaeology writes the evolution of the human superorganism – past, present, and future. This course will introduce you to the methodological and theoretical foundations of archaeological investigation, and will review the richness of global human heritage in the process. By the end of the course you should be able to evaluate scientific and non-scientific narratives about the past carefully and critically, you should have a solid foundation in the patterns, processes, and pit-falls of our global ancestry, and you should begin to see how our understanding of this collective past informs (and constrains) our march into the future. Undergraduate Lecture. Representations of “primitive” culture and life are ubiquitous in popular culture. Often harmless, and regularly humorous, the imagery of cave-dwelling, stone-age humans struggling with the limits of technology reveals much about modern predicaments. At the same time, the very notion of “primitive” invokes a relative hierarchy of value against which individuals and societies are ranked, evaluated, and often judged. In most every case, these portrayals are inaccurate. This course explores the very notion of complexity and the construction of the primitive, the portrayal of it in popular culture, print media, and film, and the archaeology of information about the past. This is an exploration of science, perception, and the history of anthropology and archaeology. Students will evaluate current and historic representations of “primitive” people and culture through the lens of contemporary research, evidence, and interpretation. Undergraduate Seminar. This course is about the archaeological dimensions of population movement, cultural transmission, and the diffusion of ideas. Efforts to identify and distinguish these processes of change have been at the core of archaeology and anthropology for more than a century, and they continue to dominate current research. By way of discussion (and occasional presentation) students will explore the theoretical approaches to migration and diffusion by drawing on the history of debate in anthropology, linguistics, geography, and biology. Theory will be applied to case studies from around the world, including the origin and spread of agriculture, the barbarian hordes of Eurasia, the colonization of Polynesia, the bow-and-arrow, iron-making around the world, inter-continental contact before Columbus, and the African origins of humanity. Students will be expected to conduct independent topical research throughout the semester. Graduate/Undergraduate Seminar. This course will explore global diversity in maritime adaptations with an emphasis on prehistoric archaeology. Case studies illustrating recurrent issues in island and coastal archaeology will serve as forums to explore the details and controversies of archaeological method and theory, many of which are relevant to prehistoric inquiry in any environment. Relevant topics include: marine resource exploitation, overexploitation, and sustainability; radiocarbon reservoir correction; ocean currents, navigation, and oceanic travel; migration and diffusion; coastal geomorphology, sea-level change, storms, and tsunamis; zooarchaeological sampling and analysis; etc. The course will consist of presentations (by the instructor and students), discussions, writing, and (when appropriate) laboratory analysis. Graduate/Undergraduate Seminar. This course is about the interactions between humans and the environment. Observations of contemporary environmental change, and projections about how change in the future might affect human society, globally and locally, feature prominently in political discourse, social and environmental movements, contemporary literature and popular culture. In large part, these projections for the future have been informed by patterns of change in the past. In this course we will evaluate these patterns of change in the environment, and in human history, and interrogate the correlations and interactions between them. Is human culture (technology, society, language, or identity) ‘determined’ by the environment? How has environmental change affected biological and cultural evolution? To what extent did human groups modify their environments in the past? How have these modifications promoted or complicated the survival and persistence of individuals, groups, organizations, behaviors and traditions? Our goal with this exploration will be a better understanding of the scale and scope of these interactions, the feedbacks between them, and the promise and perils of using the archives of climate and culture to generate predictions about the future. Graduate/Undergraduate Seminar. Widespread use of scientific methods, materials, and instruments has transformed the practice of archaeology in the past two decades. Not only has this new archaeological science (also known as “archaeometry”) enabled collection of new kinds of data, it has changed the kinds of questions archaeologists are able to ask. This seminar will introduce you to a variety of scientific approaches to data collection, in theory and in practice. The emphasis however, will be on exploring how these methods have been, and might be applied to creative, field- and laboratory-based archaeological research and inquiry. Topics will vary from year to year, but will likely include: stable isotope biochemistry, remote sensing and geophysical prospection, elemental composition analysis, absolute dating methods, and residue analysis. Graduate/Undergraduate Seminar. People have used stone to accomplish many different things for a very long time. Today, archaeologists study prehistoric patterns of stone tool production and use to track, understand, and evaluate the evolution of human behavior, cognition, and social organization around the world. This class will explore theoretical and methodological approaches to the analysis of stone artifacts, including chipped, ground, and polished tools as well as the by-products of their manufacture, for the purpose of revealing human behavior from the Lower Paleolithic to the recent era. Topics will include debates over tool form and function, questions about human mobility and trade, recent advances in the scientific approach to materials identification, the history of creative experimental replication, ideas about the nature of innovation and social learning, and a foundation in both lithic raw materials (obsidian, flint, slate, etc.) and stone tool typology (arrow heads, hand axes, metates, etc.). Two primary objectives will cross-cut all of our explorations: 1) understanding how to read behavior from patterns in archaeological data, and 2) gathering insight on the nature of technological evolution across different time scales. Graduate Seminar. This course will introduce you to the foundations of Human Behavioral Ecology as a research program, and will encourage lively debate of its merits, foibles, and flaws. Insights from this theoretical paradigm are relevant to the study of individuals and groups in all time periods, regions, and levels of cultural complexity. The introduction will be followed by a series of modules wherein students construct the basic models of HBE from scratch. Final projects will require application of original data (archaeological, observational, experimental, or creative derivations), and models in foraging ecology, territoriality, mate-choice, and exchange to both specific and general questions in anthropology and archaeology. By the end of this course you will have a solid understanding of what HBE is and isn’t, you will understand how the logic and models can be used to organize certain kinds of research, and in the process you will learn how to craft a more coherent and explicit research design. Barton, L., Shirar, S., Jordan, J. (2018) The Central Alaska Peninsula Radiocarbon Dataset. Comparative Archaeology Database, University of Pittsburgh. Morgan, C., Tushingham, S., Garvey, R., Barton, L., Bettinger, R.L. (2017) Hunter-gatherer economies in the Old World and New World, Oxford Research Encyclopedia of Environmental Science, Oxford University Press. Sturm, C., Clark, J.K., Barton, L. (2016) The logic of ceramic technology in marginal environments: implications for mobile life, American Antiquity, 81(4); 645-663. Barton, L., (2016) The cultural context of biological adaptation to high elevation Tibet, Archaeological Research in Asia, 5: 4-11. Flad, R.K., and Barton, L., eds. (2016) The Peopling of the Tibetan Plateau: a Special Issue of Archaeological Research in Asia, volume 5, Elsevier Press: Amsterdam, March, 2016. Bettinger, R.L., Morgan, C., Barton, L. (2015) The North China Nanolithic, Lithic Technological Systems and Evolutionary Theory, Goodale, N., Andrefsky, W. (eds), Cambridge University Press: Cambridge, pp. 100-116. Barton, L. & An, C.B. (2014) An evaluation of competing hypotheses for the early adoption of wheat in East Asia, World Archaeology, 46(5): 775-798. Gremillion, K., Barton, L., Piperno, D. (2014) Particularism and the retreat from theory in the archaeology of agricultural origins, Proceedings of the National Academy of Sciences, 111(17): 6171-6177. Gerbault, P., Allaby, R., Boivin, N., Rudzinski, A., Grimaldi, I.M., Pires, J.C., Viguera, C.C., Dobney, K., Gremillion, K.J., Barton, L., Arroyo-Kalin, M., Purugganan, M., Rubio de Casas, R., Bollongino, R., Burger, J., Fuller, D.Q., Bradley, D.G., Balding, D.J., Richerson, P.J., Gilbert, M.T.P., Larson, G., Thomas, M.G. (2014) Story telling and story testing in domestication, Proceedings of the National Academy of Sciences, 111(17): 6159-6164. Larson, G., Piperno, D.R., Allaby, R.G., Purugganan, M.D., Andersson, L., Arroyo-Kalin, M., Barton, L., Climer Vigueira, C., Denham, T., Dobney, K., Doust, A.N., Gepts, P., Gilbert, M.T.P., Gremillion, K.J., Lucas, L., Lukens, L., Marshall, F.B., Olsen, K.M., Pires, J.C., Richerson, P.J., Rubio de Casas, R., Sanjur, O.I., Thomas, M.G., West-Eberhard, M.J., Fuller, D.Q. (2014) Current perspectives and the future of domestication studies, Proceedings of the National Academy of Sciences, 111(17): 6139-6146. Morgan,C., Barton, L., Yi, M.J., Bettinger, R.L., Gao, X., Peng, F., (2014) Re-dating Shuidonggou Locality 1 and implications for the Initial Upper Paleolithic in East Asia, Radiocarbon, 56(1): 165-179. Yi, M.J., Barton, L., Morgan, C., Liu, D.C., Chen, F.Y., Zhang, Y., Pei, S.W., Guan, Y., Wang, H.M., Gao, X., Bettinger, R.L., (2013) Microblade technology and the rise of serial specialists in North-Central China, Journal of Anthropological Archaeology, 32: 212-223. Morgan, C., Barton, L. Bettinger, R.L., Chen F.H., Zhang, D.J. (2011) Glacial cycles and Palaeolithic adaptive variability on China's Western Loess Plateau, Antiquity, 85: 365-379. Zhang, D., C. Fahu, D. Ji, L. Barton, P. J. Brantingham, and H. Wang. 2011. Gansu Sumiaoyuantou didian shizhipin tezheng yu guhuanjing fenxi (The age, lithics, and paleoenvironment of the Sumiaoyuantou locality, Gansu Province). Renleixue Xuebao (Acta Anthropologica Sinica) 30:289-298. Bettinger, R.L., Barton, L., Morgan, C. Chen, F.H., Wang, H., Ji, D.X, Zhang, D.J., Guilderson, T.P., (2010) The transition to agriculture at Dadiwan, People’s Republic of China, Current Anthropology, 51(5): 703-704. Larson, G., Liu, R.R., Zhao, X.B., Yuan, J., Fuller, D.Q., Barton, L., Dobney, K., Fan, Q.P., Gu, Z.L., Liu, X.H., Luo, Y.B., Liu, P., Andersson, L., Li, N. (2010) Patterns of East Asian pig domestication, migration, and turnover revealed by modern and ancient DNA, Proceedings of the National Academy of Sciences, USA, 107(17): 7686-7691. Bettinger, R.L., Barton, L., Morgan, C.T., (2010) The origins of food production in north China: a different kind of agricultural revolution, Evolutionary Anthropology, 19: 9-21. Rao, Z. G., Z. Y. Zhu, G. D. Jia, F. Chen, L. Barton, J. W. Zhang, and M. R. Qiang. 2010. Huan bei taipingyang di qu dai zhi bei zhong tan san tan si zhi wu xian dui feng du yu qi hou tiao jian guan xi yan jiu (The relationship between climatic conditions and the relative abundance of modern C3 and C4 plants in three regions around the North Pacific). Zhongguo Kexue Yuan (Chinese Science Bulletin) 55:1134-1140. Larson, G., R. Liu, X. Zhao, J. Yuan, D. Fuller, L. Barton, K. Dobney, Q. Fan, Z. Gu, X.-H. Liu, Y. Luo, P. Lu, L. Andersson, and N. Li (2010) Patterns of East Asian pig domestication, migration, and turnover revealed by modern and ancient DNA. Proceedings of the National Academy of Science 107:7686-7691. Barton, L., Newsome, S.D., Chen, F.H., Wang, H., Guilderson, T.P., Bettinger, R.L. (2009) Agricultural origins and the isotopic identity of domestication in northern China, Proceedings of the National Academy of Sciences, USA 106(14): 5523-5528. Barton, L., Brantingham, P.J., Ji, D.X. (2007) Late Pleistocene climate change and Paleolithic cultural evolution in Northern China: implications from the Last Glacial Maximum. In Late Quaternary Climate Change and Human Adaptation in Arid China, edited by D.B. Madsen, X. Gao, and F.H. Chen. Elsevier, Amsterdam, p. 105-128. Bettinger, R.L., Barton, L., Richerson, P.J., Boyd, R., Wang, H., Choi, W. (2007) The transition to agriculture in northwestern China. In Late Quaternary Climate Change and Human Adaptation in Arid China, edited by D.B. Madsen, X. Gao, and F.H. Chen. Elsevier, Amsterdam, p. 83-101. An, C. B., L. Tang, L. Barton, and F. H. Chen (2005) Climate change and cultural response around 4000 cal yr B.P. in the western part of the Chinese Loess Plateau. Quaternary Research 63:347-352.